Interventions in Value Added Industries takes place within a strategic as well as a local context. Development has been done in order to develop informed national or large-scale strategies as well as local interventions in the form of pilot projects. The utilisation of biomass is expected to create an additional benefit stream for WfW, and concurrently create the opportunity for economic empowerment of historically disadvantaged individuals (HDIs). This will be achieved through the development of down-stream industries, which will operate either independently, or as partnerships between the public and private sectors. The removal of cleared biomass, particularly from the Western Cape, southern parts of the Eastern Cape, North West and Mpumalanga Provinces, has for many reasons become essential. In doing so: biological diversity is conserved; water security is improved through the enhancement of streamflow and ground water sources; ecosystem processes such as the impacts of fires and floods improved; the productive potential of land restored and sustainable use of natural resources promoted. By buying these products people contribute both to supporting environmentally sound products, produced by emerging small business, and to supporting the WfW programme as a whole and its objectives of water security, biodiversity/natural diversity, economic empowerment, ecological processes and social development. WfW and DEAT have formed a partnership to address wetland rehabilitation. 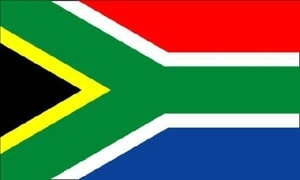 In 2001/2 R30 million has been allocated towards wetlands projects throughout the country. The projects include national priority wetlands (including existing and proposed Ramsar Wetlands of International Importance). The employment to be created from implementing these projects is expected to be over 2000 people. Most of the projects in 2000/1are considered to have been highly successful, judging by the immediate response of the wetlands and the amount of sediment trapped by erosion control structures within only a few months after construction. Rehabilitation work carried out by workers employed in the wetlands projects includes gabion construction, the removal of invasive alien plants in the immediate area, surveying of flood irrigation furrows, construction and placing of grass bale gabions and leveling of drainage furrows. WfW workers construct gabions at a wetland in the NW/Gauteng region. 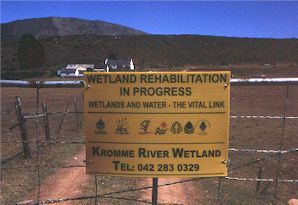 Farmers in the Kromme River area show their support for wetlands rehabilitation on their property.